This Electronic Circuit Project of high voltage generator circuit. This high voltage generator was designed with the aim of testing the electrical break-down protection used on the railways. These protection measures are used to ensure that any external metal parts will never be at a high voltage. If that were about to happen, a very large current would ﬂow (in the order of kilo-amps), which causes the protection to operate, creating a short circuit to ground effectively earthing the metal parts. This hap-pens when, for example, a lightning strike hits the overhead line (or their supports) on the railways. This generator generates a high voltage of 1,000 V, but with an output current that is limited to few milliamps. This permits the electrical breakdown protection to be tested with-out it going into a short circuit state. The circuit uses common parts throughout: a TL494 pulse-width modulator, several FETs or bipolar switching transistors, a simple 1.4 VA mains transformer and a discrete voltage multiplier. P1 is used to set the maximum current and P2 sets the output voltage. The use of a voltage multiplier has the advantage that the working voltage of the smoothing capacitors can be lower, which makes them easier to obtain. 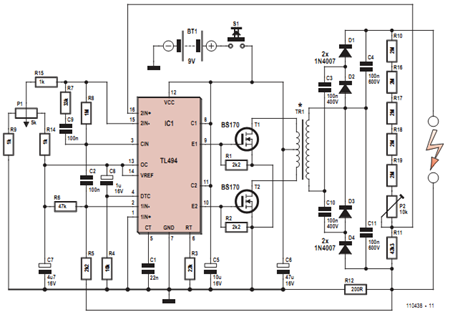 The TL494 was chosen because it can still operate at a voltage of about 7 V, which means it can keep on working even when the batteries are nearly empty. The power is provided by six C-type batteries, which keeps the total weight at a reason-able level. The 2x4 V secondary of AC power transformer (Tr1) is used back to front. It does mean that the 4 V winding has double the rated voltage across it, but that is acceptable because the frequency is a lot higher (several kilo-Hertz) than the 50 Hz (60 Hz) the transformer is designed for. The ﬁnal version also includes a display of the output voltage so that the breakdown volt-age can be read. From a historical perspective there follows a bit of background information. In the past a different system was worked out. Every high-voltage support post has a protection system, and it isn’t clear when the protection had operated and went into a short-circuit state due to a large current discharge. Since very large currents were involved, a certain Mr. Van Ark ﬁgured out a solution for this. He used a glass tube ﬁlled with a liquid containing a red pigment and a metal ball. When a large current discharge occurred the metal ball shot up due to the strong magnetic ﬁeld, which caused the pigment to mix with the liquid. This could be seen for a good 24 hours after the event. After a thunder storm it was easy to see where a discharge current took place: one only had to walk past the tubes and have a good look at them.